Frain, Sylvia (2018). 'Make America Secure': Media, militarism and climate change in the Marianas Archipelago. 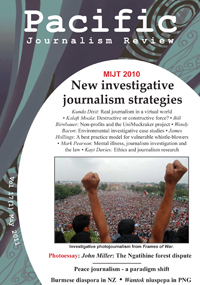 Pacific Journalism Review : Te Koakoa, 24(2), 218-240. Robie, David (2018). Kele'a, va, kororonga, talanoa and tapoetethakot: Expanding millennial notions of 'Pacific way' journalism education and media research culture. 26th Asia Media Information and Communication (AMIC) Centre Conference, Manipal, South India. Robie, David (2018, November 8). Kanaky independence campaign rolls on ... encouraged by ballot result. [Part 2]. Asia Pacific Report [Online]. Robie, David (2018, November 7). New Caledonia stirs painful memories - and a hopeful future [Part 2]. Asia Pacific Report [Online]. Nakhid, Camille (2018, September 15). Camille talks to TTT Live about 'decolonising' research. Trinidad and Tobago Television. Ellis, Gavin (2018, August 23). RNZ Nine to Noon tribute to Pacific Media Centre postgraduate students. [Commentary on Radio New Zealand]. Robie, David (2018, August 7). David Robie talks to Radio 531pi host Ma'a Brian Sagala about the legacy of the 1985 South Pacific Nuclear Free Zone Treaty. [Interview with Radio 531]. Bell, Jean (2018, May 4). PMC director condemns 'targeting' of journalists and silence on West Papua. [Seminar by Dr David Robie]. Asia Pacific Report. Robie, David (2018, February 25). More frontline research 'by Pacific for Pacific' plea at climate conference. Asia Pacific Report [Online]. Robie, David (2018, February 24). Juffa blasts PNG resources 'sell out' but tells of Managalas hope. Asia Pacific Report [Online]. Robie, David (2018, February 23). Underestimate climate change political upheaval 'at peril', warns former PM. Asia Pacific Report [Online]. Robie, David (2017, November 15). Indonesia's development dilemmas - a green info gap and budget pressure. Asia Pacific Report [Online]. Borrowdale, James (2017, July 22). Why Pacific and Maori communities are rising up for a free West Papua. Asia Pacific Report and VICE [Extensive interview with PMC's David Robie). [Online]. Pacific Media Watch (2017, July 13). PNG court silences political blogger's comments, blogger posts gag image. IFEX [Canada]. Pacific Media Watch (2017, July 13). PNG court silences political blogger's comments, blogger posts gag image. Asia Pacific Report. Robie, David (2017, January 15). Endangered - the frontline journalism of outrage [Review]. Asia Pacific Report. Robie, David (2017, January 12). Florida airport shootings - few basic questions being asked. Asia Pacific Report. Pacific Media Watch Freedom Project (2017). Full year's research and current affairs file. Pacific Media Centre. Robie, David (2016). 'Unfree and unfair'? Media intimidation in Fiji's 2014 election. In Lawson, Stephanie, and Ratuva, Steven (Eds. ), The People Have Spoken: The 2014 Elections in Fiji (pp. 83-107). Canberra: Australian National University. Abplanalp, Karen (2016). Media restrictions on Papua - understanding the restrictions. AUT Master of Communication Studies exegesis and microsite. Robie, David (2016, September 1-3). From Un Tavur to Asia Pacific Report: Case studies in campus-based social justice media. Counter Futures Conference, "Social Movements, Resistance and Social Change", Victoria University, Wellington. Robie, David (2016, April 17). Pacific human rights as a 'mindful' journalist. [Extracted from keynote address by Dr Robie]. "Enhancing a Human rights-based approach to news reporting" Forum in Nadi, Fiji, 13-15 April 2016. Robie, David (2016, December 3). Carry on Fidel Castro's global legacy, urges Cuban ambassador. Asia Pacific Report. Robie, David (2016, September 19). Philippines 'hit man' allegations spur renewed calls for killings probe. Asia Pacific Report. Robie, David (2016, September 3). Rendezvous with the 'no nukes' Aneityum cover girl after 33 years. Vanuatu Daily Post. Camille Nakhid (2016, July 30). A Wiradjuri grandmother's sad story: 'The Stolen Generations have never stopped'. Asia Pacific Report. Camille Nakhid (2016, July 22). Still stealing the generations - the abduction of Indigenous Australian children still goes on. Asia Pacific Report. David Robie (2016, July 6). Interviewed by 95bFM's Andrew Winstanley on the university student unrest in PNG. 95bFM, University of Auckland. David Robie (2016, April 28). 'Pacific media ought to bear witness to human rights violations' - David Robie. Triple RRRT Project of the United Nations Development Programme, Nadi, Fiji. David Robie (2016, April 26). PMC director calls for 'voice for the voiceless' at Pacific human rights forum. AUT News. David Robie (2016, April 9). Polar bear mojo for Rainbow Warrior skipper's environmental thriller [Review of Greenpeace Captain]. Asia Pacific Report. David Robie (2016, February 17). Mystery of the 1983 Vanuatu 'nuclear free' girl finally solved. Cafe Pacific. 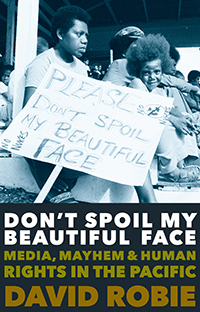 Robie, David (2015, June): Don't Spoil My Beautiful Face: Media, Mayhem and Human Rights in the Pacific [2nd edition]. Auckland: Little Island Press in association with the Pacific Media Centre. Robie, David (2015). Unfree and unfair? Media intimidation in Fiji's 2014 election. In Ratuva, Steve, and Lawson, Stephanie, Fiji's 2014 General Election. Canberra: Australian National University (In production). Robie, David (2015). Cybercrime, criminal libel and the media: From 'e-martial law' to the Magna Carta in the Philippines. Pacific Journalism Review, 21(1): 212-230. David Robie (2015, November). Rainbow Warrior's truth-seeking remembered as secrecy lingers. Pen, Sydney. David Robie (2015, July 3). David Robie discusses the Rainbow Warrior with French news agency AFP - Neil Sands. David Robie (2015, June 29). David Robie discusses the Rainbow Warrior with German news agency DPA - Christiane Oelrich. Shailendra Singh (2015, April 17). Nuclear testing legacy haunts Pacific island people. [Interview with PMC's David Robie]. IDN-InDepth News. Robie, David (2014, April 24): Don't Spoil My Beautiful Face: Media, Mayhem and Human Rights in the Pacific. Auckland: Little Island Press in association with the Pacific Media Centre. Korauaba, T. (2014). Kiribati media, science and politics: telling the story of climate change in a 'disappearing nation'. 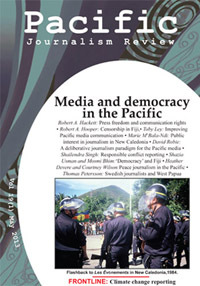 Pacific Journalism Monograph No 3 (34pp). Auckland: Pacific Media Centre. Robie, David (2014). 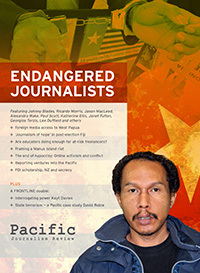 Pacific Media Watch and protest in Oceania: An investigative free media case study. 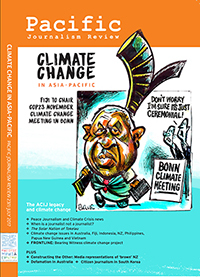 Pacific Journalism Review, 20(1): 35--60. Robie, David (2014). 'Carbon colonialism': Pacific environmental risk, media credibility and a deliberative perspective. 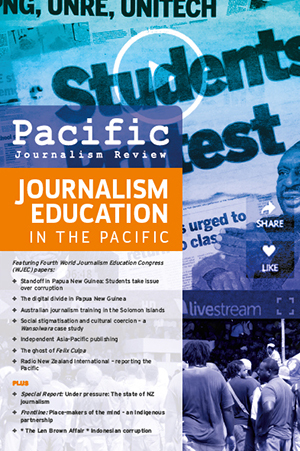 Pacific Journalism Review, 20(2): 59-76. Oosterman, Allison (2014). 'The silence of the Sphinx': The delay in organising the media coverage of World War II. 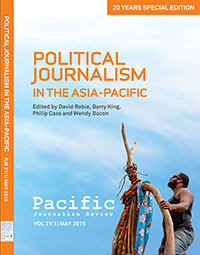 Pacific Journalism Review, 20(2): 187-204. Robie, David (2014). Coconet w-fi, digital technology, business and education. Oral -presentation - plenary. Asian Development Bank (ADB), Pacific Business Media Summit, Sydney, Australia. 25-26 March 2014. Robie, David (2014). West Papua: The Pacific's secret shame: the challenges for Pacific news media. Oral presentation - keynote. Faculty of Law, University of Auckland. 1-2 August 2014. Robie, David, and Abcede, Delia (2014). Cybercrime, criminal libel and the media: from 'e-martial law' to the Magna Carta in the Philippines. Pacific Journalism Review Twentieth Anniversary Conference, AUT University, 27-29 November 2014. David Robie (2014, September 28). Fiji elections - freedom and fairness for the media? Interviewed by Colin Peacock, Radio NZ Mediawatch. David Robie (2014, September 27): From Fiji's dictatorship to 'democracy' - the AUT student team on the job. Commentary on The Daily Blog. David Robie (2014, September 23). Call for repeal of Fiji's media decree. Interviewed by Bruce Hill, Radio Australia. David Robie (2014, September 20). A Fiji democratic mandate for the coup leader - what now for the media? Café Pacific, New Zealand. Alistar Kata (2014, September 9). Student journalist on the challenges of covering Fiji's election. Interviewed by Bruce Hill on Radio Australia's Pacific Beat. Anna Majavu, David Robie (2014, August 28): East Timor court media ruling sparks confusion, triggers global petition - Lasse Underbjerg. Pacific Scoop. David Robie (2014, June 15): David Robie on human rights in the Pacific - Wallace Chapman. Radio New Zealand's Sunday. David Robie (2014, June 8): David Robie talks media freedom on Radio Australia - Phil Kafcaloudes . Radio Australia. David Robie (2014, May 29): David Robie talks media freedom to Media Watch - Richard Aedy. Radio Australia's Media Watch. David Robie (2014, April 24): New book focusing on secret history of Pacific - Indira Moala. Radio NZ International. David Robie (2014, January 20): East Timor takes on Australia in 'rip off' spy case with country's future on line. PMC Online Special Reports. Drageset, Daniel (2013). Constructing 'dark' celebrity: The case of Anders Breivik. Pacific Journalism Review, 19(2): 70-85. Robie, David (2013). 'Four World' news values revisited: A deliberative journalism paradigm for Pacific media. Pacific Journalism Review, 19(1): 84-110. Robie, David (2013). Deliberative journalism, environmental risk and media credibility. Islands and Nations: 'Failed states' and the environment in the Pacific conference. University of the South Pacific, Suva, Fiji, 10-11 July 2013. Robie, David (2013). Relatoriu media nia liberdade iha Azia Pasifiku liqa ho Timor-Leste. La'o Hamutuk - Timor-Leste Institute of Reconstruction Monitoring and Analysis, Dili, Timor-Leste, 26 November 2013. David Robie (2013, Dec 20). East Timor's Independente champions genuine 'free press'. PMC Online Special Reports. David Robie (2013, Nov 25): Read draft media law first, East Timor's print adviser tells critics. Cafe Pacific ISSN 1562-4315. Robie, David (2012). 'Four Worlds' news values revisited: A deliberative journalism paradigm for Pacific media. Paper presented at the Media and Democracy Symposium at the University of the South Pacific, Suva, 5/6 September 2012. Devere, Heather; and Wilson, Courtney (2012). Peace/conflict journalism in the New Zealand media? Reporting on 'the Arc of Instability' in the Pacific. Paper presented at the Media and Democracy Symposium at the University of the South Pacific, Suva, 5/6 September 2012. Robie, David (2012). Credibility of social media: Trust - should the public believe what they're told? 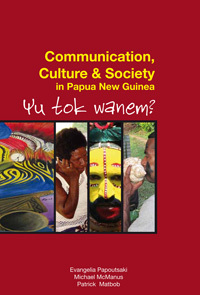 Presented at the Second Pacific Media Summit, Pacific Harbour, Fiji, 26-30 March 2012. Abplanalp, Karen (2012). 'Blood money': A NZ investigative journalism case study. Pacific Journalism Review, 18(1): 128-147. Deliberative journalism - Article by David Robie, The Fiji Times, 13 September 2012. Pacific investigative journalism study author calls for more collaboration - Interview with Pacific Journalism Review contributor Shailendra Singh, Pacific Media Watch, 30 June 2012. West Papua violence escalating amid media's 'silent treatment' - Interview with Pacific Media Watch's Alex Perrottet on Radio bFM, 25 June 2012. Kiribati govt must come clean over newspaper investigation - academic - Interview with PMC director Dr David Robie by Radio NZ International, 25 June 2012. Kiribati newspaper closes amid police probe - Inter5View with PMC director Dr David Robie by Radio Australia, 22 June 2012. Pacific Media Centre says Kiribati government rtries to muzzle independent paper - Interview with PMC director Dr David Robie by Radio NZ International, 23 May 2012. Pacific Media Watch praises RNZI for PNG coverage - Interview with Pacific Media Watch's Alex Perrottet on Radio bFM' s Southern Cross, 19 April 2012. 'Peace journalism' in conflict resolution in the Pacific - Interview with PMC director Dr David Robie by Radio Australia's Geraldine Coutts, 18 April 2012. Fiji Television on PIMA Pacific summit - Interview on FT's Close-Up programme with PMC director Dr David Robie, 17 April 2012. Peacemaker Kalafi Moala - Analysis in the Fiji Sun by PMC director Dr David Robie, 9 April 2012. PINA moves on with Moala's 'go forward' plea - Analysis on PACNEWS by PMC director Dr David Robie, 4 April 2012. PINA summit assessed positively by commentator - Interview by Radio NZ INternational with PMC director Dr David Robie, 3 April 2012. Tonga's Moala calls for Pacific media unity - Analysis on Pacific Islands Report by PMC director Dr David Robie, 2 April 2012. Peacemaker Moala helps bury the hatchet over PINA tensions - Analysis on Cafe Pacific by PMC director Dr David Robie, 2 April 2012. Barnett, S, & O'Rourke, S. (2011). Communication: Organisation and innovation. (3rd ed.). Kuala Lumpur: Pearson. O'Rourke, S. & Johnson, R. (2011). Internationalising a media studies degree in Arab Higher Education: A case study arising from an agreement between New Zealand and Oman in Sabry, T. (Ed). Arab Cultural Studies, Mapping the Field. London: IB. Tauris. (Publication in November). Cass, P. (2011). 'Teacher! Teacher! I want "A", teacher'. Pacific Journalism Review, 17(2):130-147. O'Rourke, S. ( 2011). Teaching Journalism in Oman: Reflections after the Arab Spring. Pacific Journalism Review .17 (1) : 109- 129. O'Rourke, S. (2011 ). Curriculum development for Oman 2006 - 2011: Implications for off-shore education and challenges for intercultural communications within New Zealand. New Zealand Communication Journal Special edition: Intercultural Communication. (12)1: 42 - 56. Robie, D. (2011). Iconic media environmental images of Oceania: Challenging corporate news for solutions. Dreadlocks. v6/7. 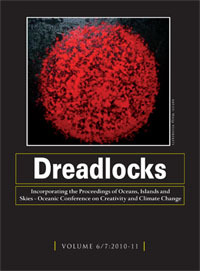 Incorporating the Proceedings of Oceans, Islands and Skies - Oceanic Conference on Creativity and Climate Change, Suva, Fiji, September 2010. Forthcoming. Robie, D. (2011). ‘Drugs, guns and gangs’ and a growing Pacific state tendency to deploy NZ media regulators to stifle investigative reportage. Presented at the "Back to the source" Investigative journalism conference, University of Technology, Sydney, 16-17 September 2011. Robie, D. (2011). Creative Commons and a Pacific media 'hub': A news education model amid crisis, Journalism Education Association of Australia (JEAA) conference in Adelaide, South Australia, 28-30 November 2011. Manning, B. S. (2011). Security intelligence and the public interest: An examination into how keeping security intelligence and classified information secret, and privy only to a state's executive and aligned operational agencies, affects the function of a modern democracy. An exegesis presented as a companion document attached to the creative component documentary, Behind The Shroud, for a Master of Communication Studies degree at AUT University. Pacific Journalism Review launches new website - Interview with PMC director Dr David Robie by Radio Australia's Geraldine Coutts, 20 December 2011. Radio NZ's Mediawatch - Interview with Pacific Media Watch project editor Alex Perrottet by Jeremy Rose, 11 December 2011. Academic condemns lack of NZ coverage of West Papua crisis - Interview with PMC director Dr David Robie in Adelaide, 4 December 2011. New Zealand Herald op-ed article on the British phone-hacking inquiry - Alex Perrottet of Pacific Media Watch, 2 December 2011. Vanuatu media black spot - interview with PMW's Alex Perrottet by Radio Australia's Pacific Beat presenter Geraldene Coutts, 16 November 2011. The Australian's Media - Interview with PMC director Dr David Robie and profile of Pacific Journalism Review media freedom report, 14 November 2011. Papua a media black spot - article in New Matilda by Alex Perrottet and David Robie, 24 October 2011. Peace journalism researcher warns on turmoil repercussions in Pakistan - Interview with doctoral candidate Rukhsana Aslam by Radio Australia, 24 May 2011. Marat, D., Papoutsaki, E., Latu, S, Aumua, L., Talakai, M., Sun, K. (2010). Akoaga - Retention & achievement in the New Zealand tertiary sector: Perspectives of students & parents from Pasifika communities on efficacy, agency & success. Presentation at the 34th Annual Pacific Islands Studies Conference University of Hawaii Celebrating connections: 60 years of Pacific Studies 4-6 November 2010. Miller, J., and Peters, G. (2010). Seeing the wood for the trees: media coverage of the 1970s Ngatihine Forestry Block - a case study. Paper presented at the Media, Investigative Journalism and Technology Conference at AUT University, December 4/5. PANPA Bulletin (2010, March) - Fiji to issue new media decree. Interview with David Robie on media censorship in Fiji.